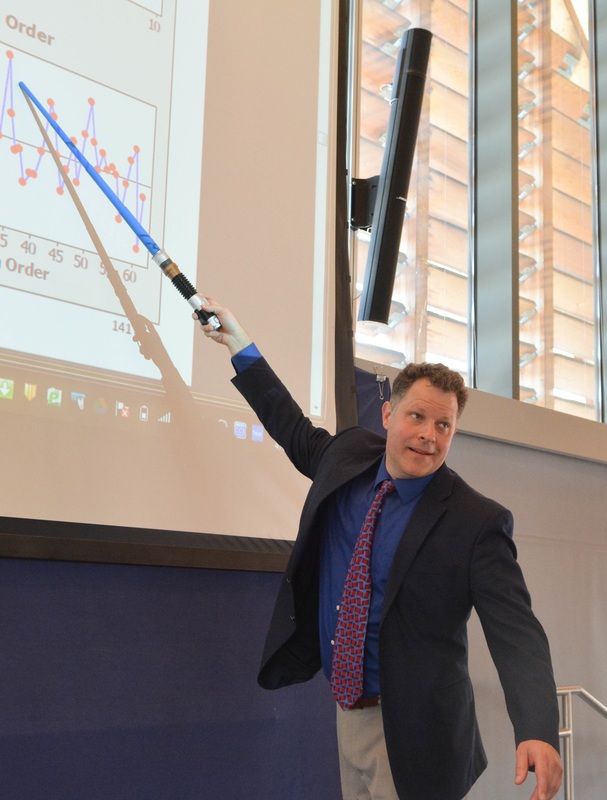 Jonathan Reuning-Scherer, Senior Lecturer in Statistics and Forestry and winner of the 2015 Richard H. Brodhead ’68 Prize for Teaching Excellence, takes his audience through a tour of the hardware, software, and web-based interfaces he used to incorporate Panopto’s video capturing service available into his teaching. Reuning-Scherer usefully points out that many classrooms at Yale are already equipped with permanent cameras, which allow faculty to video their lectures and other class activities. Panopto is able to simultaneously capture video of the classroom, audio from microphones, and presentations or other media projected on screens. Importantly, Reuning-Scherer demonstrates that it isn’t only the way he manages and organizes video content, but that it is also the way his students access and watch that content. Using Panopto in three of his courses over the past year, including STAT 10x, an Intro Stats course with 250 undergrads, as well as a flipped version of this course for graduate students, he found that students used the service in different ways. But by capturing his lectures, all students are able to go back and review course materials on their own time. Reuning-Scherer also gives a demonstration of Media Libary in Canvas, where Panopto appears. During the Q&A portion of the talk, an audience member points out that instructors can annotate videos as certain points, and students can send questions based on time codes, as well.